Case 1: A 4-year-old girl with prior history of congenital heart defects presented with lethargy, decreased appetite and intermittent fevers. On examination, a nontender mass was noted in the right upper quandrant. 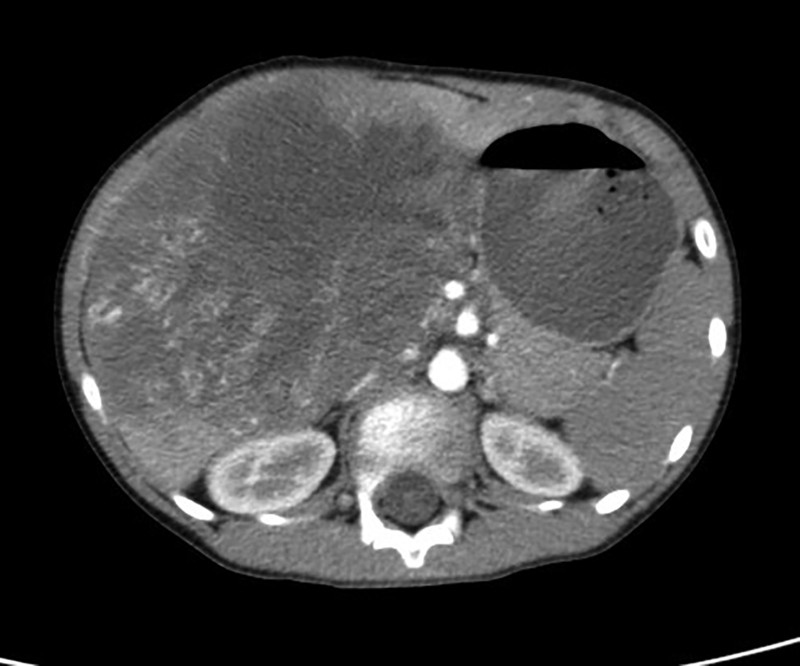 Case 2: A 7-year-old boy with no medical history presented with abdominal mass, discomfort, nausea, lethargy and early satiety. 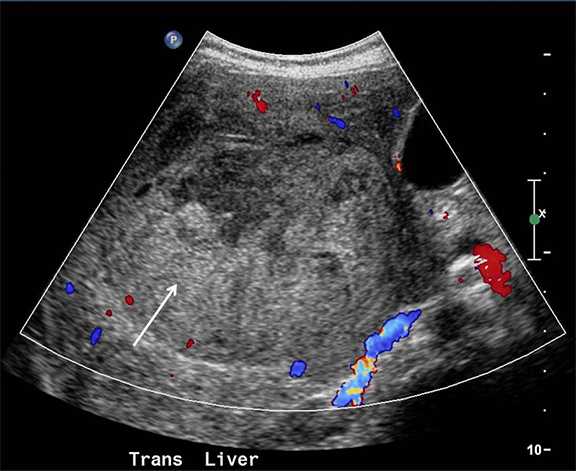 Case 1: Initial abdominal ultrasound scan demonstrated a large heterogeneous, echogenic mass within the liver displaying poor blood flow (Figure 1). 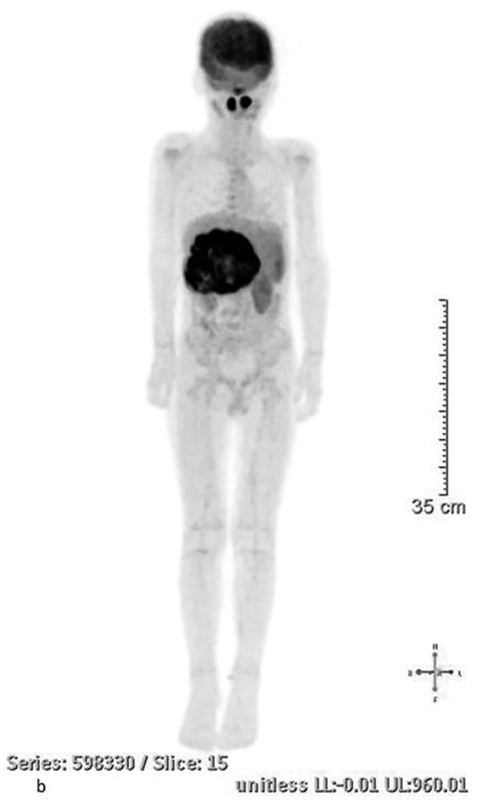 A contrast-enhanced CT scan of the chest, abdomen and pelvis was then performed, revealing a well-defined, hypodense mass in the right lobe of the liver (Figure 2) measuring approximately 11.3 cm AP x 9.8 cm transverse x 9.2 cm in the sagittal plane. An arterial phase CT scan showed a hypodense mass with a hyperdense rim (Figure 3A) and a delayed venous phase scan showed the low-density mass with areas of increased density displaying the solid nature of the lesion (Figure 3A). These findings combined with biopsy confirmed undifferentiated embryonal sarcoma (UES). 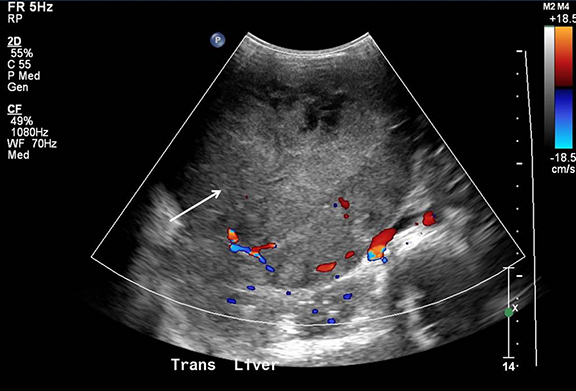 Case 2: An abdominal ultrasound scan initially revealed a large heterogeneous lesion in the center of the liver with a small amount of blood flow (Figure 4). 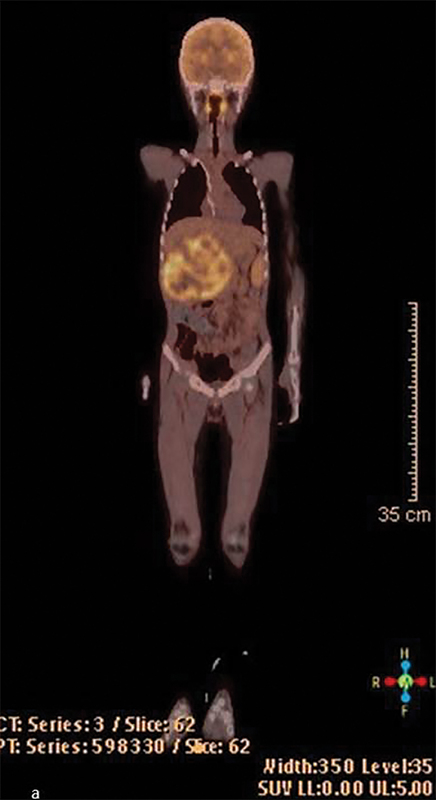 Inconclusive ultrasound results warranted a CT scan of the chest, abdomen and pelvis with contrast, which showed a heterogeneous low-density lesion within the right lobe of the liver that extended to the left lobe (Figure 5). The mass measured approximately 12.3 AP x 12.3 transverse x 10.7 in the sagittal plane. Arterial-phase CT showed a well-defined hypodense mass with vessels coursing throughout (Figure 6A). Delayed venous phase demonstrated the solid consistency of the mass by showing continued filling in of the mass (Figure 6B). A PET scan was done to evaluate the extent of the disease. FDG-avid tissue was documented in the large lobulated hepatic mass (Figure 7A,7B). Undifferentiated embryonal sarcoma of the liver. Differential diagnoses include: hepatoblastoma, hepatocellular carcinoma, cystadenocarcinoma, hydatid cyst or atypical metastases. UES is characterized as a solid tumor, most often in the right lobe of the liver, which grows rapidly, causing the development of cysts as a result of necrosis. On ultrasound UES typically appears as a well-defined heterogeneous echogenic hepatic mass with small anechoic areas. 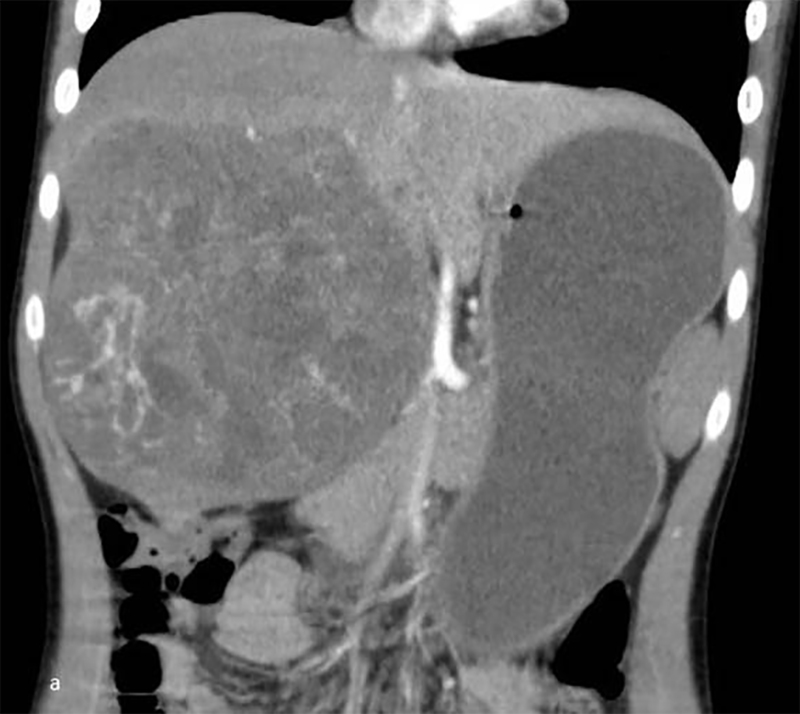 Computed tomography (CT) generally shows a well-defined, intrahepatic mass that is hypodense compared to surrounding parenchyma with various hyperdense septae and solid portions throughout. CT may also reveal a thin, dense rim surrounding the tumor, which on pathologic exam corresponds to a fibrous pseudocapsule. Comparison of pre- and postcontrast CT scans may show a more prominent low attenuated mass in the postcontrast phase.3 Using magnetic resonance imaging (MRI), UES appears as a hypointense and hyperintense signal on T1- and T2-weighted images, respectively. 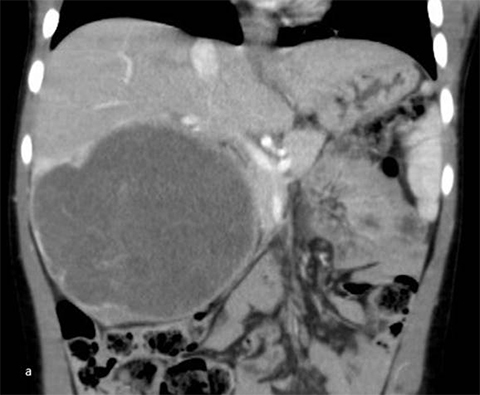 Contrast MRI often shows a heterogeneous enhancement of the mass, which is most prominent in the late portal venous phase.4 UES is often misdiagnosed as a cystic mass or hematoma based on the cystic appearance seen on CT and MRI. Overall, ultrasound gives a more accurate depiction of the solid tumor consistency and allows for a more precise differential diagnosis. 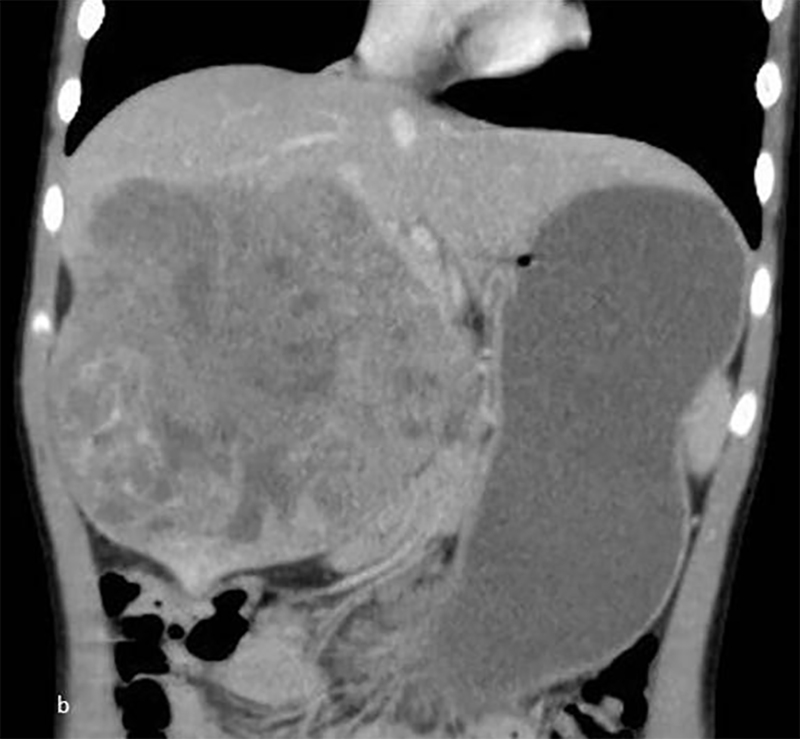 Undifferentiated embryonal sarcoma of the liver is a rare and highly aggressive primitive mesenchymal neoplasm that should be considered in pediatric patients presenting with a right upper quadrant mass and nonspecific constitutional symptoms. An early, accurate diagnosis and prompt introduction of treatment is directly related to a better prognosis and increased survival rate. Putra, J., Ornvold, K. Undifferentiated Embryonal Sarcoma of the Liver: A Concise Review. Arch Pathol Lab Med. 2015;139:269–273. Plant, A., Busuttil, R., Abbas, R., et al. A Single-institution Retrospective Cases Series of Childhood Undifferentiated Embryonal Liver Sarcoma (UELS): Success of Combined Therapy and the Use of Orthotopic Liver Transplant. Journal of Pediatric Hematology/ Oncology. 2013; 35(6): 451-455. Moon, W., Kim, W., Kim, I., et al. 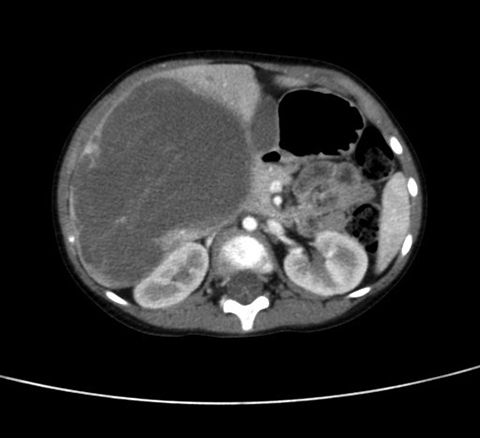 Undifferentiated embryonal sarcoma of the liver: US and CT findings. Pediatric Radiology. 1994; 24: 500-503. Walther, A., Geller, J., Coots, A., Towbin, A., Nathan, J., Alonso, M., Sheridan, R., Tiao, G. Multimodal therapy including liver transplantation for hepatic undifferentiated embryonal sarcoma. Liver Transplantation. 2014; 20(2):191-9. Cao, Q., Ye, Z., Chen, S., et al. Undifferentiated embryonal sarcoma of liver: a multi-institutional experience with 9 cases. Int J Clin Exp Pathol. 2014; 7(12): 8647–8656. Li, X., Gong, S., Song, W., et al. Undifferentiated liver embryonal sarcoma in adults: A report of four cases and literature review. World J Gastroenterol. 2010;16(37): 4725–4732. 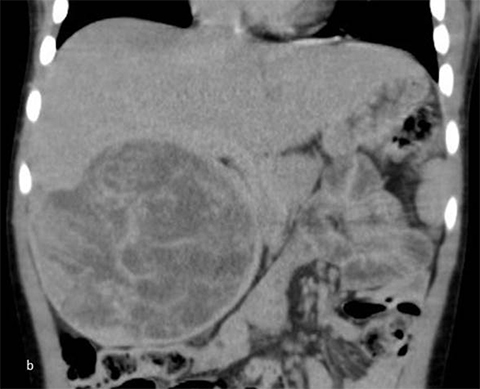 Pediatric Radiological Case: Undifferentiated embryonal sarcoma of the liver. Appl Radiol. Prepared by Ms. Karlovich while a medical student Midwestern University; Dr. Jorgensen and Dr. Richard Towbin while at Phoenix Children’s Hospital, Department of Radiology, Phoenix, AZ; and Dr. Alexander Towbin while at the Department of Radiology Children’s Hospital of Cincinnati, Cincinnati, OH.